Somehow I had never heard of Kentucky Route Zero before PSX 2017. I guess having a strict focus on console games—specifically PlayStation—will do that to you. So when I sat down in Annapurna’s booth to play the game I had no idea what to expect. Honestly, the name made me think it had something to do with some kind of horse derby, but that couldn’t be further from the truth. 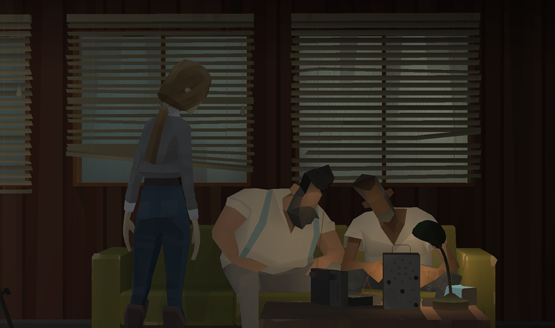 Kentucky Route Zero is a dark mystery, an intriguing narrative that unfolds through the thoughts and actions of the characters. My demo started, and stayed, in a cramped TV studio situated in a tiny town, presumably in Kentucky. The lead character can’t move much, staying rooted to one spot and twisting around to see the various other characters, interacting with them and having her own thoughts. Kentucky Route Zero is effectively a point and click style adventure, with a great UI system that adds to the mystery on consoles. To be honest, not much happened in the demo that I played, but it didn’t stop the whole thing from being exceptionally intriguing. These two guys sit in a TV station and mess with a broken radio. The roof of the TV station leaked as the rain poured outside. Two men sat on the couch tinkering with an old radio. A strange woman came in to interview on air, and I was asked to find an old tape that supposedly gets played again and again. Each moment was filled with snippets of stories that only increased the intrigue and the drive to learn more. More about this strange town. More about these characters. More about exactly what the hell is going on. For as mundane and seemingly dull as the demo was, there was definitely an underlying tone of something very weird going on. And still I went on performing mundane tasks and having thoughts about the storm outside. 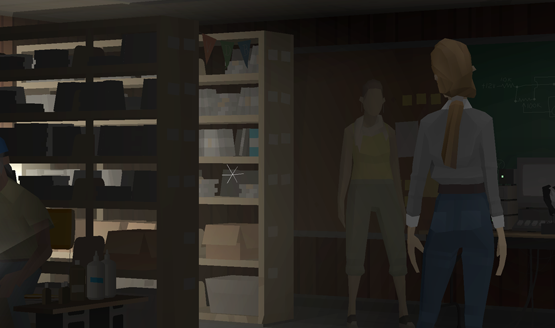 Kentucky Route Zero’s very simple art style means that the focus lies on the story and dialog, even if it’s internal dialog. It means that spinning in circles in a tiny TV studio crammed like a sardine can full of people is simply about catching players’ interest through the strange way that this story is told. One of the developers told me that this is a section from later in the game, so its understandable that I had no idea what the hell was going on. As confused as I was though, I still really wanted to find out more. There’s a strange show on one of these shelves that needs to be broadcast. Formed as a Kickstarter back in 2013, Kentucky Route Zero has been coming out in episodes, with the fifth episode yet to release. Kentucky Route Zero: TV Edition will be a collection of all five episodes, including smaller interlude episodes that come between each. Previously only released on PC, this new packaged edition will be the first time that the game hits consoles. The story follows a truck driver named Conway and the people that he meets when he tried to cross Route Zero. There are a lot of weird things going on on, around, and under Route Zero, setting the stage for each subsequent chapter. Honestly, it’s hard to say I really played a demo of Kentucky Route Zero, but the small part of the game I experienced had a sense of atmosphere and mysterious storytelling that keeps eating at me. I can’t say exactly why Kentucky Route Zero seems so intriguing to me, but perhaps more about what wasn’t shown or said than what was. How can I possibly explain that I desperately want to play a game based on things that weren’t part of the demo I played? It’s not the TV station, the broadcast, or the people crammed inside. It’s the untold stories of each of those things that drive my eagerness like a truck across the mysterious Route Zero.